It might feel like a winter nightmare outside right now, but as we know from Calgary’s long history of hormonal weather patterns, it likely won’t last long. Even so, the days are short, the air is nippy, and the season can feel longer than most… but we encourage you to bring back the magic of winter and enjoy all of the fun adventures that the season can bring. Remember the joy you felt as a kid when a fresh layer of snow fell, and you couldn’t wait to throw on your snowsuit and go outside to make a simple snow-angel? That’s exactly the magic we’re talking about chasing! With the mountains in our backyard and world-class powder at our fingertips, there are so many opportunities to get outdoors and have some fun this winter. Whether you’re looking for an exciting adventure with the whole family or a romantic afternoon soirée with your S/O, we’ve got you covered. We have put together a list of nine fun outdoor activities that are off the ski hill and a very short drive away from this beautiful city. There is nothing more romantic than gliding hand-in-hand around an outdoor rink. Plus, we are certain that the kids will love it. Head to one of Calgary’s many outdoor rinks or enjoy a bucket-list worthy experience as you skate amidst the beautiful Rocky Mountains. This bonafide, all-Canadian activity requires no skill and is a thrilling experience that the whole family can enjoy. Don’t let the eight lanes at Mt. Norquay fool you— this high-speed tube park will get the wind rushing past you as you grip onto your tube in sheer excitement. Challenge your friends to competition as you whiz down the hill grinning from ear to ear. You can enjoy this adventure during their regular hours in the afternoon or enjoy the adventure at night as they light up their Tube Park on Friday and Saturday evenings. 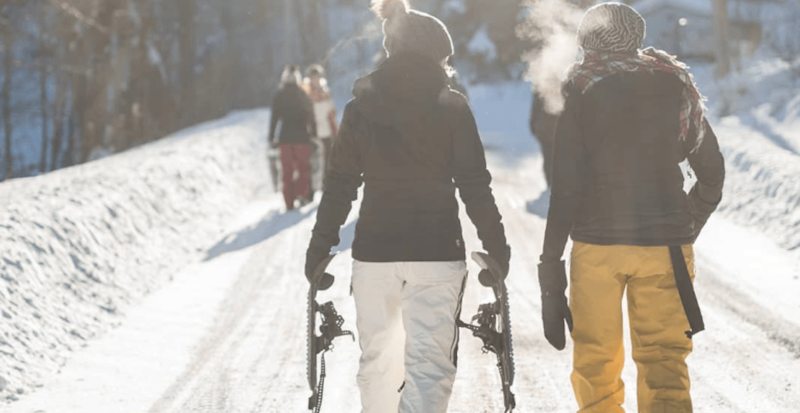 Take in the crisp outdoor air and the picturesque views as you march your way through the many trails in and around the Calgary area – plus, it’s a great workout! If you are of an inner city roamer check out Fish Creek Park Or Nose Hill for some fantastic trails close to home. If you’re interested in taking a drive out to the Rockies, Canmore, Bragg Creek and Banff all boast unreal trail paths that lead to some magical destinations. Be sure to check trail reports before heading out, and always dress for the weather! This is a great way to enjoy the outdoors, get active, and take in the breathtaking scenery around you. Don’t forget your layers, a protein fuelled snack, and your camera – if you have room for it! Take in the magical winter wonderland from a different perspective: On the back of a dogsled! You’ll have the opportunity to connect with the dogs, get a tour of the area from your certified guide, and even practice your hand at being a real musher. Looking for an extra experience? Try out Ski Jöring, where you can combine recreational skiing and dog sledding! Looking for a new winter activity to try your hand at? Test the waters with ice fishing. In the city, try out some spots like Chestermere Lake, Bearspaw Reservoir, or Bruce Lake Ghost Lake — if they’re all safely frozen over, that is. If you’re looking for more of an epic adventure try out one of the many lakes up in the Rockies, or book a guided tour to show you the ropes. Pedal bikes with 4.5″ wide bike tires along a snowy trail to a picturesque frozen waterfall that you can only find in the midst of the mountains. You definitely need some biking experience, but there is no need to be an expert. At Kananaskis Outfitters, you will receive a bike and helmet rental, a tour by a certified guide, and complimentary hot chocolate and cookies! Hot, warm, cold, rest, repeat! Relax in the mountains and enjoy the therapeutic effects of hydrotherapy. Although this is an 18+ facility, it’s the perfect way for adults to reset after a long day of adventuring, or simply soak off the week as the kids enjoy a snowy activity! Get a birds-eye view of the city and the snow-capped Rockies as you gain a new perspective of our beautiful province through the window of a helicopter with MVH Mountain View Helicopter Tours. This is one of those once-in-a-lifetime experiences that will definitely be remembered for years to come. Just don’t forget the camera!